Bonjour! It's been a while, hey? I took what felt like a very long blogging break (my longest ever) and my blogiversary reminded me that it was time to get back to this little space. I'm celebrating five years of FFID today. I read somewhere that most blogs are abandoned after 3 months so it feels like it's an achievement that FFID has lasted this long. To be completely honest with you, my blog has been through a mini existential crisis lately... Why do I blog? What should I blog about? Will I still blog in five years? While these aren't questions that keep me up at night, they have been playing on my mind of late. These last five years have flown by but I really don't want my content to go stale and I want to make sure I keep enjoying the blog. More than anything I found myself having real social media fatigue, so after a few crazy weeks I spent a week in Donegal doing a digital detox like last year, it was pure bliss. But then I started to miss the blog... and I also remembered why I've been writing it for the last five years. This little website I started on my sofa 5 years ago has brought me real fulfilment and has truly changed my life. It allowed me to connect with strangers through a subject I'm passionate about. It made me meet inspiring food professionals and it even helped me create my own path in the food industry. Without the blog I would never have had the confidence to speak in front of a crowd, never mind on national radio. I would certainly never have started my own company. It really helped me to believe in myself and it made me grow in a way that I would have never imagined. So yes, it's not always perfect like pretty Instagram pictures, sometimes I suffer from Impostor Syndrome or Writer's Block but when it happens I just step back and try to remember why I started. I don't have a blogging strategy for the next 5 years (not even for the next month) and I don't look at my stats or social media following like I probably should. All I know is that some lovely people out there have been following me along the way and that's what I enjoy the most. 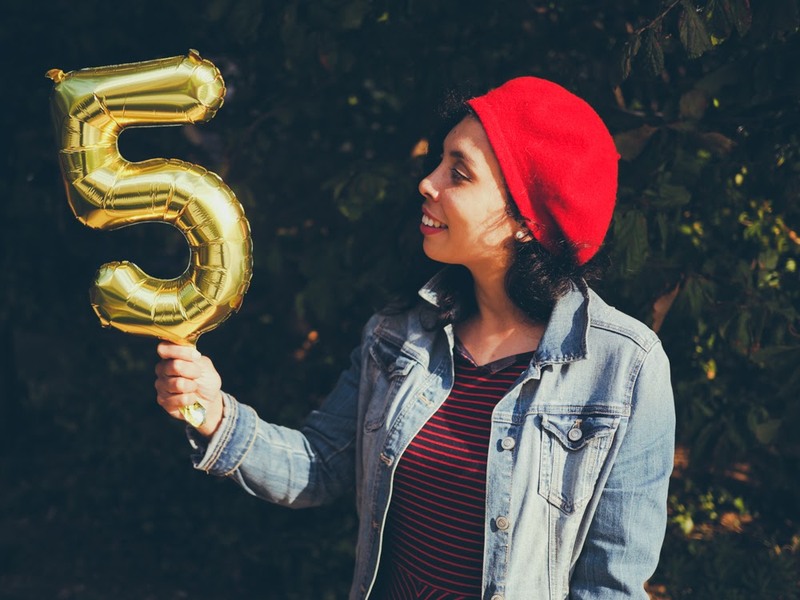 These last five years have been amazing thanks to the people who have supported me and trusted me throughout this blogging journey. So THANK YOU, I don't take you for granted and I can't wait to be back here more regularly!